...... could be different to each layouts, or set specific layers been turn off to all the drawings. 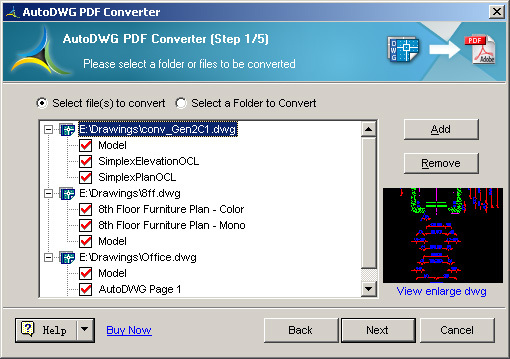 AutoDWG PDF to DWG Converter SA help you convert pdf to dwg and pdf to dxf file. Convert AutoCAD? drawings to vector PDFs with Solid Converter DWG. Qweas is providing links to DWG to PDF Converter AutoDWG 4.31 as a courtesy, and makes no representations regarding DWG to PDF Converter AutoDWG or any other applications or any information related thereto. Any questions, complaints or claims regarding this application DWG to PDF Converter AutoDWG 4.31 must be directed to the appropriate software vendor. You may click the publisher link of DWG to PDF Converter AutoDWG on the top of this page to get more details about the vendor.